“Deuce’s whole world has changed. Down below, she was considered an adult. Now, topside in a town called Salvation, she’s a brat in need of training in the eyes of the townsfolk. She doesn’t fit in with the other girls: Deuce only knows how to fight. To be completely honest, this was a disappointment. What is it with Aguirre and her second installments in the series being less than great?! I have yet to finish Hell Fire from the Corine Solomon series, even though I thought the first novel was brilliant. As I’m sure you guessed by now, “Outpost” was not what I expected. The novel starts with a short recap of the first books story, skillfully written by Aguirre so it doesn’t come across as annoying or repetitive. Or so I thought. In truth, repetition was one of the problems of this book, whether it came in the form of Deuce’s memories which prompted, at times, whole paragraphs from the first book, or in the form of Deuce’s motto: “I’m a Huntress”. If I had to hear/read that one more time.. Even if two whole months passed since Deuce and her friends arrived in Salvation, she’s still stubborn to the point of being downright petulant when it comes to adapting to this new life and understanding/learning this society’s rules. She keeps calling married couples Breeders, children she calls brats. I loved her character in “Enclave” because it showed her as open-minded enough to accept another life and reality, but not in this book. Not at first, anyway. Her attitude is understandable to a point, but soon it becomes tiresome and annoying. We do get to see more of her and Fade and the beginning of a real relationship between the two. But that ends pretty much as soon as it begins. I actually liked Stalker more than I did in the first book. He’s changing from the brute that he was, while still being loyal to Deuce. I certainly don’t like him as a love interest and I can’t stand the love triangle thing that’s going on, but that’s that. ( Again, the author sure seems to like love triangles). 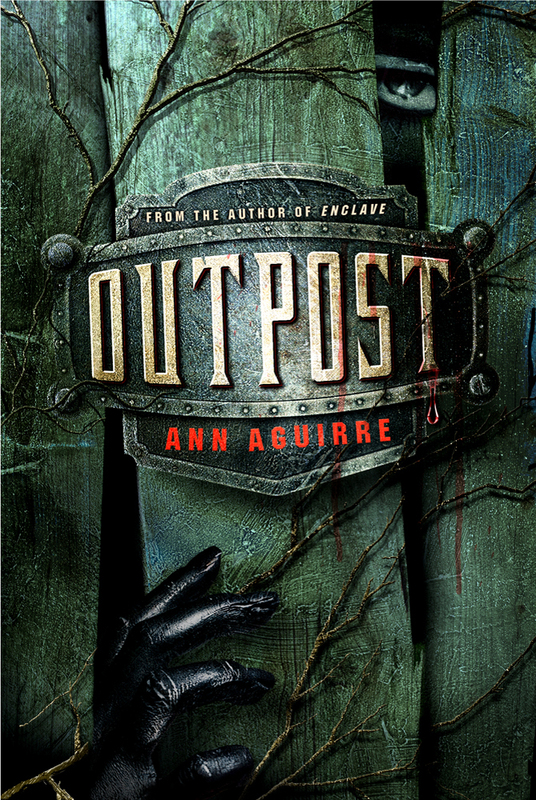 If you’re expecting “Outpost” to be as action packed as the first installment was then think again. It’s more centered on the relationships between characters than it is on action scenes. We do get a few of those, but they’re extremely rare and end quickly. Frankly, the first half of the book was rather boring because nothing really happened. To make matters worse, we don’t get any more explanations to any questions the first novel posed. We still don’t know how the Freaks came to be even though they make a solid and consistent presence throughout the book or what happened that turned this world into a post-apocalyptic one. What we do get is a picture of how the Freaks are evolving. They’re no longer the mindless creatures they were. One other thing that bothered me, minor as it is, was that Aguirre didn’t provide us with an answer as to why Deuce can hear Silk’s voice in her head. It happens on several occasions and one might think it’s just her own inner voice, but that doesn’t explain the semi-prophetic things she heard from Silk towards the end of “Enclave”. While the world building severely lacked because of many still unanswered questions, the writing was good. I do like Aguirre’s writing very much, it’s easy to follow and clear, with one (not so) tiny problem: she chose to explain every single thing happening to her characters and every single thing they did, instead of just showing us, letting us figure it out on our own or letting said things speak for themselves. Overall and despite everything I just said, this isn’t a horrible or even bad book. It was ok and it will prove a decent read as long as you don’t expect much to happen. I’m still invested into this series and I will read the next installment as well. If only to get my answers.